Overall, turfgrass samples submitted to the NC State Turf Diagnostics Lab were down by 6% when compared to 2015. 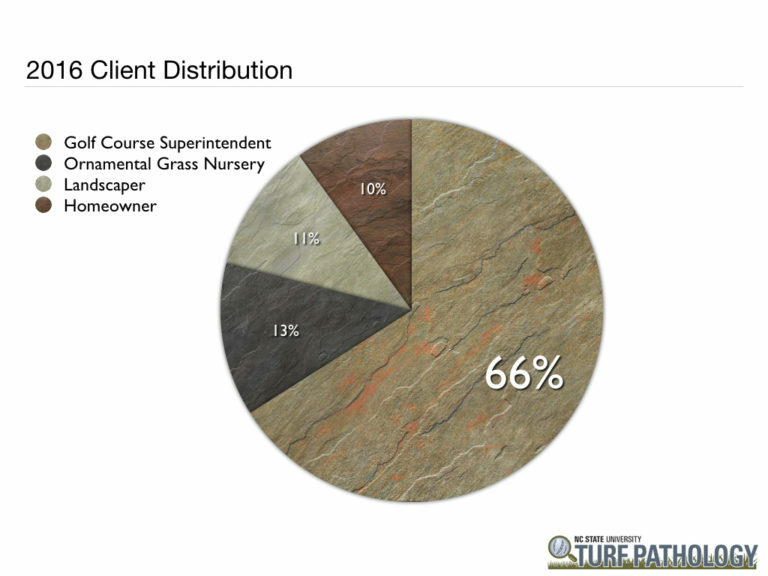 As expected, the majority (66%) of our samples came from golf course putting greens. 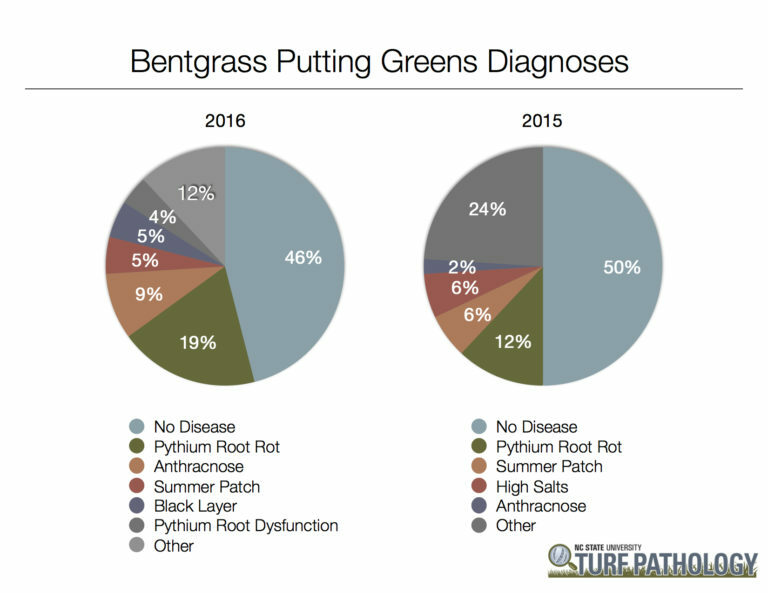 Creeping bentgrass putting green samples were down 5% while bermudagrass putting green samples were up 12% when compared to 2015. Below you will find information regarding all golf course putting green samples submitted in 2016. Enjoy! WARNING! – These charts only indicate the samples we have received in our lab here at NC State. 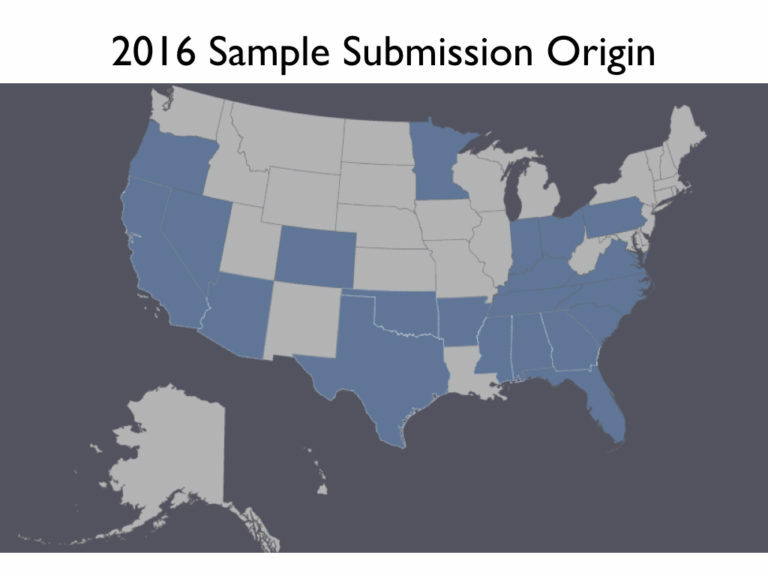 While we do receive samples from various regions of the country, the majority (~80%) of creeping bentgrass and bermudagrass putting green samples come from the southeastern United States. The following post only covers data collected from all golf course samples. A similar landscape version will be posted soon. 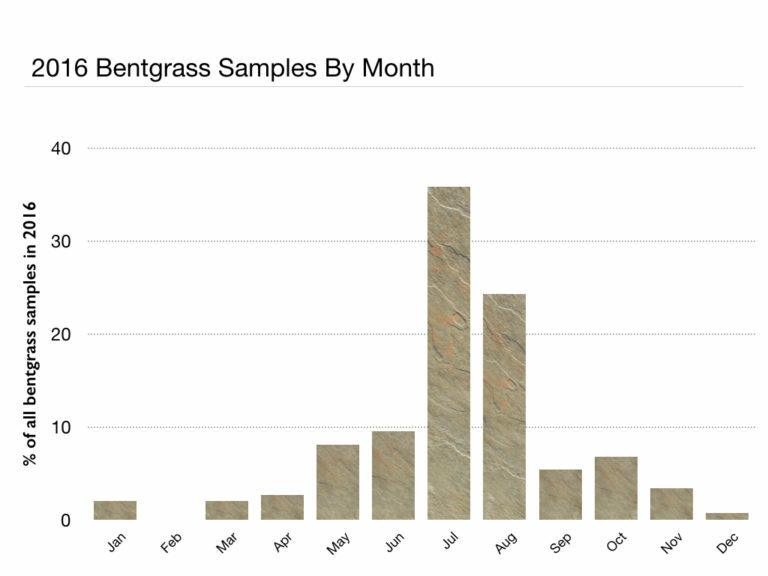 For the most part, creeping bentgrass samples followed the same trends we observed in 2015. The yearly chart above is usually about the same with the majority of samples coming during periods of stress between June and August as it always has been since we started tracking this information back in 2008. Now, think about all of the problems listed on the pie chart above. With the exception of summer patch when it creates nice little rings, they can all look similar! It’s very hard to diagnose any of these biotic and abiotic diseases in the field with 100% accuracy without looking under a microscope or testing for high salt levels. Once again, remember that rarely do growers send us samples of things like fairy ring, brown patch, dollar spot, etc. that are relatively easy to diagnose in the field. Also, receiving a diagnosis of “no disease” is equally as valuable as receiving a disease diagnosis. There are lots of things that cause turfgrass quality to decline, don’t assume it has to be a disease. 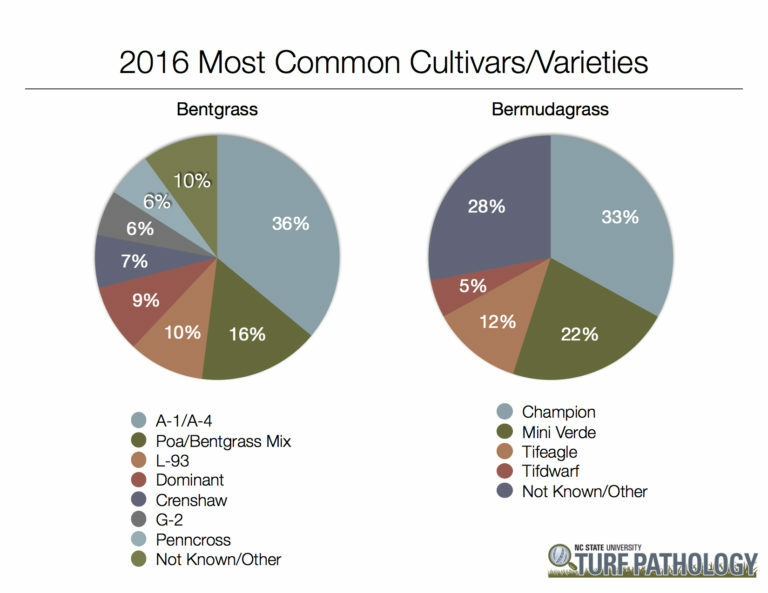 Just like the bentgrass chart, the bermudagrass chart follows a very similar path each and every year. The problems are fairly well distributed throughout the year with a spike in the spring at green-up. 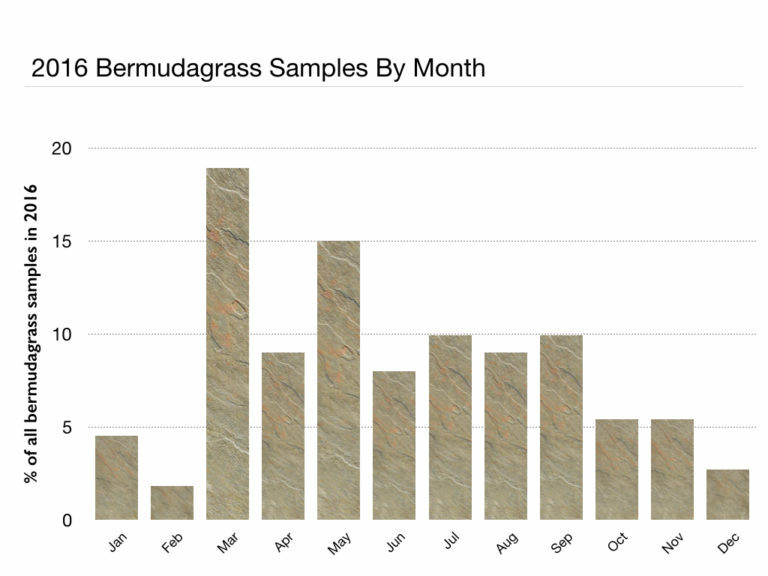 We did notice some differences in 2016 vs. 2015 with regards to bermudagrass samples. Take-all root rot (a.k.a. 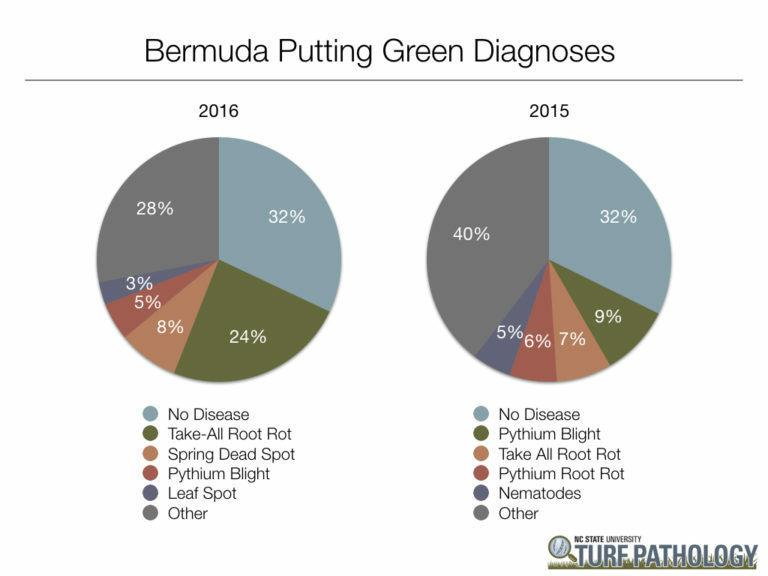 bermudagrass decline) moved to the top of the list. We saw a significant increase in the occurrence of this disease starting in fall of 2015 when weather conditions were abnormally wet and warm for extended periods of time. This damage continued into 2016, thus prompting many folks to submit samples for confirmation. Spring dead spot makes the top list for the first time, again likely due to a warmer/wetter fall in 2015. Mini ring doesn’t make the list again this year, however most people have learned how to diagnose that one on their own or we will confirm their suspicions via photographs, so very few physical samples are sent for confirmation. NC State Regional Turfgrass Conferences benefit anyone managing a lawn/landscape. Pre-registration recommended to guarantee a spot. 2017 NC State Turfgrass Short Course is a comprehensive turfgrass education compacted into one intensive week of study. This five-day course is appropriate for all interested in turf including homeowners, career-changers, and professionals needing a refresher. Lectures are presented by faculty of NCSU’s award-winning turfgrass program and cover all aspects of turfgrass management. The NCSU Turfgrass Short Course is the best PRACTICAL how-to education you can get in a one-week study program. This program is held ONLY ONCE a year. Don’t miss out!